In addition to securing good percentages and passing with flying colours in SSC examinations, these 40 students included a few who are making India proud when it comes to extra-curricular activities. There are computer wizards, chess masters, swimmers, Tabla players, singers and actors as well. NAB honorary secretary general Satya Kumar Singh felicitated successful students on Saturday. Honorary secretary Anand Athalekar, Executive director Pallavi Kadam, deputy director Archana Joshi and representatives from Mission Vision and Maharashtra Seva Sangh Mulund were present. Teacher at NAB Rajeshree More conducted the program. 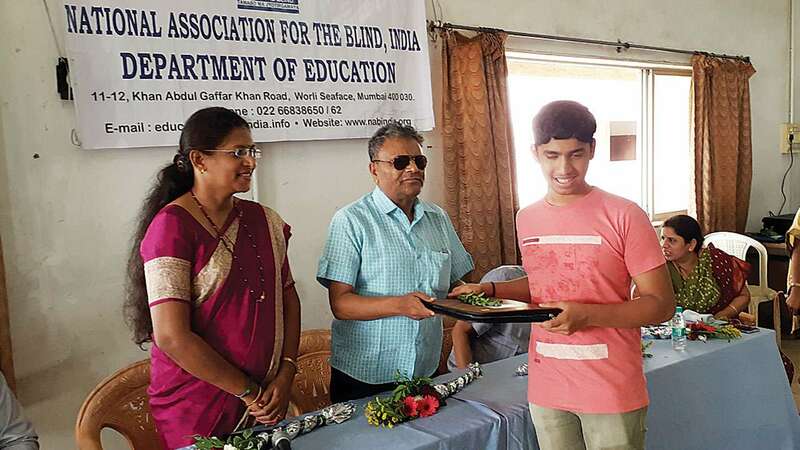 Aryan Bhalchandra Joshi from Dombivli secured 86.60 per cent while passing SSC examinations. Aryan is a chess player as well as swimmer and has so far won five gold and 2 silver medals at state and National level competitions. He would be going to Poland next month for World Junior chess championships representing India. Aryan had created history when he stood first among 350 chess players and he stood first in open category where sighted players were also present. He was seventh among top 40 in the World in chess when he competed representing India in Mesodonia in 2017, said Aryan's mother. Siddhartha Sawant has secured 95.40 per cent marks in SSC. He is a state level and a National level swimmer. He has won 3 silver and 4 bronze medals in swimming and also plays the Tabla and Piano.